Collection States define the possible states for the Collection and the graph of transitions between the states. A state is represented on the Collection by a value of the status property. The user that triggers the transition has the rights to do so. Some conditions are met. Conditions correspond to a function that is evaluated. Conditions are met when the function returns a true code. The transition from one value to another can trigger an action. For more information, see "Create Collection States" in the AI Suite Administrator Guide. Object States defines the possible states for the Object and the graph of transitions between the states. A state is represented on the Object by a value of the status property. 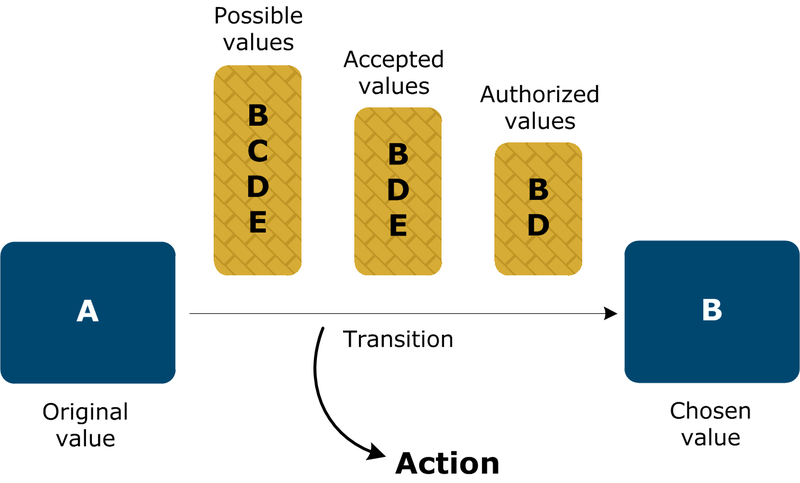 As for the Collection States, transitions between states can be conditioned and can trigger an action. For more information, see "Create Object States" in the AI Suite Administrator Guide.